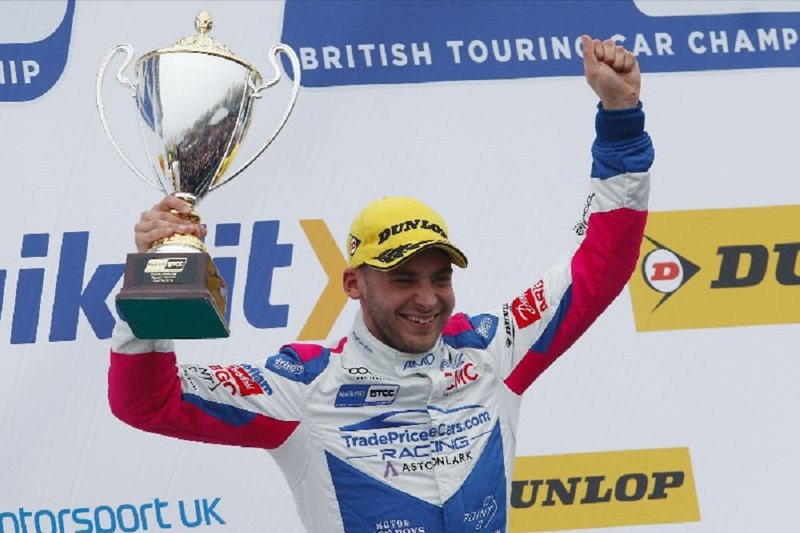 The Trade Price Cars Racing team enjoyed a stunning start to the new Kwik Fit British Touring Car Championship season with a podium finish first time out at Brands Hatch. Having entered the series in partnership with AmD Tuning, the award-winning Essex-based motor dealership headed into its home race hoping for a strong performance on track with a pair of Audi S3s being driven by rising star Jake Hill and former F1 racer Mark Blundell. A tricky qualifying session in damp conditions on Saturday saw Jake qualify in 15th place on the grid and he saw a chance to make strides forwards in the opening race when changeable weather conditions on Sunday morning presented a chance to gamble on tyre selection. Electing to go with slick tyres compared to the wets being fitted to a number of the frontrunners, Jake had to take it easy through the opening laps before track conditions came to him. Once the Audi was dialed into the conditions however, Jake made rapid progress through the order with the end result being a stunning second place finish; matching his best result from twelve months ago and securing the best result in the series for the car. Having used the tyre gamble to get to the front, Jake showed stunning pace once again in the second race of the weekend, despite now carrying additional success ballast in the car. A fourth place finish added more strong points to his tally and he looked well placed to make it a hat-trick of top six finishes in race three until contact at Druids resulted in damage to the car that would force him to retire. Despite that, he ends the weekend sitting sixth in both the overall and Independents’ Trophy standings. Team-mate Mark was left with work to do going into race day after an incident in qualifying resulted in him losing his quickest time in the session, which meant he started his maiden race in the series down in 28th place. Like Jake, Mark elected to run slick tyres, which added an extra challenge in the opening laps as he waited for the track conditions to come to him. Soon making up places, Mark climbed steadily through the field to run as high as twelfth and would cross the line at the end in 14th place to secure a points finish on his first outing in the car. The less favourable soft tyre played a major part in Mark ending up with a 27th place in race two, but he would make forward progress once again in race three to bring home a second top 20 finish of the weekend; gaining valuable knowledge and experience to take into the second round of the year at Donington Park later this month. After a strong start to the year, Trade Price Cars Racing sits fourth in both the Teams’ Championship and the Independents Teams’ Championship standings. “It’s been a great way to start the season and I have to say a huge thank you to everyone in the Trade Price Cars Racing team for their work. To come away from Brands Hatch with a podium finish is fantastic and has given us something to build on. “The opening race was similar to last year with the call on the tyres and we got it spot on. Slicks was certainly the right way to go and when the conditions came to us, the Audi was mega and I could pick people off and work my way forwards. “Race two was a surprise because the car held on really well with the extra weight onboard and then we were showing mega pace again in race three before someone got a bit greedy and we were caught up in an incident that ended things abruptly. “This weekend has been one of the biggest challenges of my career in terms of the learning curve I’ve faced; it’s been incredibly steep. I’ve had to learn about the car, the racing environment and the challenges of managing a soft tyre that certainly wasn’t the optimal one for the conditions. “Overall, there is a huge amount that I can take away from Brands Hatch and the team has done a great job. Jake has picked up some really good results, and I’m pleased to have been able to score some points first time out in the car.